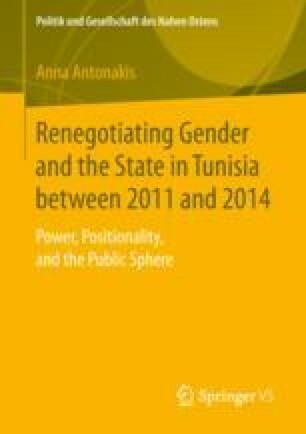 This chapter engages with the changes in the structural dimension of the public sphere, focusing on the negotiations of institutions that would limit and open up access to the public sphere in a gendered analysis. I employ the term of political transformation with reference to the new state institutions that were created following the Tunisian uprisings, namely, the interim governmental institutions, the Independent High Authority for Elections (Instance Superieure Indépendante pour les Elections, ISIE), which prepared the elections of 2011 and 2014, the National Constituent Assembly (Assemblée Nationale Constituante, ANC) and, most prominently, the new Tunisian constitution of 2014. This specification with regards to political transformation aims also to clarify the theorization of state institutions and their implication in structuring hegemonic publics as well as counterpublics.